Congratulations to the LWVLMR planning team on the successful 48th Annual Conference and Business Meeting in Glenview, Illinois! 140+ attendees from all four Lake Michigan states enjoyed meeting each other and learning about current issues and strategies during the two day event. Many options for advancing our 2015-2016 Program were offered, and you will hear more about these over the coming year. 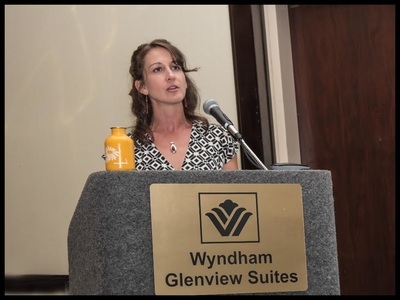 Friday's keynote speaker, Dr. Abigail Derby Lewis, Climate Ecologist at the Field Museum and Co-Chair of the Chicago Wilderness Climate Action Committee. 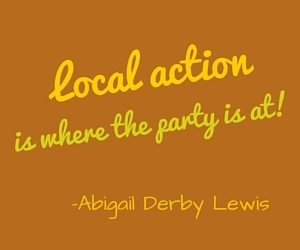 advised us that "Local action is where the party is at.” Choices we make in our yards, in our municipalities, counties and states, were featured as the impacts of climate change become evident all around us. 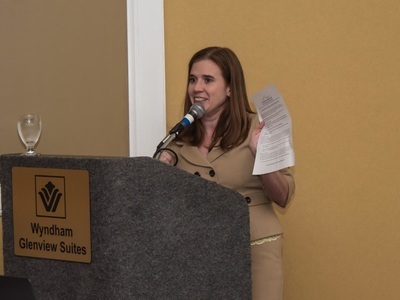 Saturday's keynote speaker, Molly Flanagan, Policy Director at The Alliance for the Great Lakes provided us with a wealth of opportunities to become better informed and involved. To learn more about the Great Lakes Restoration Initiative, click here. To contact your elected officials to encourage them to support long-term Great Lakes restoration funding and more, click here. To sign a petition urging regional leaders to protect our drinking water from harmful algae, click here. If you are worried about Asian carp, click here. Stay tuned - we'll have more opportunities for both individual and LWV actions as the year progresses. From Moms' Clean Air Force founder Jody Elysee Poster, www.momscleanairforce.org, we learned about the power of social media as a tool for reaching national environmental goals. Susie Schreiber, Chair of the Waukegan Harbor Citizens Advisory Group, www.waukeganharborcag.com, demonstrated the power of a citizen action group to make 100% certain that an Area of Concern really is cleaned up and that local citizens can swim and fish safely in Lake Michigan. Jen Walling, Executive Director of the Illinois Environmental Council, www.ilenviro.org, opened our eyes to the importance of working relationships with our elected officials in the state legislature, and encouraged us to seek out opportunities with folks we don't necessarily consider our friends! Thanks to our LWVLMR moderator of this panel, Judy Beck! Also, thanks to LWVLMR's Krista Grimm, winner of this year's Illinois Carrie Chapman Catt award, who moderated the second panel. From Faith In Place's Lake County Outreach Director, Susana Figueroa, www.faithinplace.org, we had a crash course in successful community outreach, beginning with youth. Jean Pogge is CEO of the Delta Institute, www.delta-institute.org, and she described a very successful outreach program to involve local farmers in sustainable, nutrient-reduction practices. Clare Tallon Ruen, www.lakedance.org, combines her passion for the Great Lakes and dance in a program called LakeDance. All 3rd and 6th graders in IL School District 65 get to learn about and problem solve different Lake Michigan issues in the program she devised at the grass-roots level...needless to say, Clare leaped at the chance to get all of our attendees dancing as well! Thanks for Everything, Team 2015!